Colchester United's plans to play the last Football League game of the Millennium fell apart when the scheduled game with Wycombe was postponed with just over two hours left before the kick-off time of 7.45pm. Match referee Keith Hill was due to inspect the Layer Road pitch at around 4.00pm but having arrived late eventually inspected the pitch at 4.45pm. By this time the Wycombe Team coach, five supporters' coaches as well as hundreds of others by car, were already on route to Essex. Hill made the decision to inspect again at 6.00pm after being concerned about an area of the pitch under the 'main' stand but due to the rapidly dropping temperature eventually called the game off at around 5.30pm. Wycombe's Team Coach got as far as Brentwood before being informed, while the WWISC coaches had already arrived for their pre-match drink at Feering (eight miles from Colchester). The OWWSA coaches delayed their departure until 4.30pm waiting for a pitch inspection and were eventually informed by mobile phone having got as far as St.Albans. Both Supporters' Clubs are covered by insurance in these situations and fans will have the opportunity to re-claim the cost of the coach travel or travel again for free when the game is re-arranged. Colchester's Commercial Manager Brian Wheeler told the Essex Evening Gazette "It's unfortunate and we are obviously disappointed for the fans and apologise to them. "We are gutted because such a lot of work goes into preparing for matches and we were expecting possibly our best crowd of the season, between 4,500 and 5,000. "People said we should have postponed it at lunchtime but it was playable then and after the first inspection it was probably okay with a bit of work. "But it was dependant on the weather which was obviously getting worse - the one thing the referee didn't want to do was start the game and then have to abandon it." Ironically if the game had been played on the original time and date, along with all the other Football League games on Tuesday 28th December, Colchester would not be substantially out of pocket due to the loss of gate and commercial revenue and fans from both clubs would not have had their time wasted. WHO ARE THE MAGINIFICENT SEVEN? The stats gurus at Carling OPTA have supplied Chairboys on the Net with some interesting statistics regarding the strike force at Wycombe. Who has the highest shooting accuracy? Who has the best goals to shots ratio? Find out by clicking here. The Wycombe Wanderers Official Website will be re-launched in the New Year thanks to the help of Paul Lewis from Chairboys on the Net. The Club approached Paul to discuss ways of improving in the site and the outcome has been that Paul will become Webmaster for the site and will be responsible for updating the site with content provided by the Club and adding match details shortly after the final whistle of First Team games. The site is currently undergoing a make-over and will be re-launched on Monday 3rd January 2000. Speaking about this, Lewis said "This is certainly an exciting opportunity for the Club to continue their commitment to communicating with the fans and with the experienced gained from producing COTN for the past four years, we can offer a good mix of internet and fan based knowledge to the Club." He also stressed that "COTN will remain unaffected by the changes to the Official site and more importantly will allow us to concentrate more on fan related issues in addition to our usual unique content. As ever we welcome any feedback and will develop both sites based on your suggestions". Lawrie Sanchez has finally struck a deal with Boreham Wood to sign left winger Matt Brady. Brady has been with Wycombe on loan for the past month but the clubs have struggled to agree terms for a permanent move. Brady has now been signed on a contract that will keep him at Wycombe until the end of the 2000/1 season and Wycombe will also play Boreham Wood in a pre-season friendly instead of paying a significant transfer fee. As the snow and ice hit the country, Tuesday's reserve game at Swindon was postponed until later in the season. It was hoped that Alan Beeton and Mark Rogers would return from injury for this game but this has now been put on hold until Tuesday 4th January 2000 when the reserves clash with Chesham United in the Berks and Bucks Senior Cup at Adams Park. Paul McCarthy is also hoped to be fit for this game after his lay-off since being injured in training in September. Andy Baird was sent-off as Wycombe took a point from the Friday evening trip to Ashton Gate to play Bristol City. The game ended goalless although both sides had chances to take all three points. Baird's red-card means he will miss the holiday clash with Chesterfield at Adams Park, as will Steve Brown who picked up his fifth yellow of the season. Wycombe fans had to battle through horrendous traffic conditions to reach Ashton Gate on Friday evening. The 200 or so loyal Wycombe fans spent anything up to four hours travelling the 112 mile journey. City moved the game to the Friday, without objection from Wycombe officials, in an attempt to reduce the affect of Christmas shoppers. The idea back-fired though as the gate of 8,195 was City's second lowest league gate of the season (only Colchester attracted fewer fans). Wycombe have another Friday night game later in the season after Cardiff moved their League game at Ninian Park to Friday 3rd March 2000 - something to do with egg-chasing taking place on the Saturday. Once again it seems that the fans are the last people to be considered by Club Officials who then have the audacity to criticise supporters for staying away. Full match report from Ashton Gate via this link. Wycombe's reserve side came away from Dean Court on the end of a 5-0 thrashing from Bournemouth in their final group game in the Avon Insurance Combination League Cup on Wednesday afternoon. Wycombe conceded two goals within as many minutes in the first half and barely created a serious effort on goal in the ninety minutes. Mark Westhead and Mark Osborn shared the goalkeeping duties and Osborn saved a penalty in the dying minutes to prevent Wycombe being knocked for six. Danny Senda and Roger Johnson were booked for Wycombe while on a positive note Dannie Bulman had another good game in his Captain's role. Wycombe Wanderers Youth Team have been drawn away to Newcastle United in the Fourth Round of the FA Youth Cup. The tie will be played on Thursday January 20th 2000 - kick-off 7.00pm at St.James Park. This is the first time that a Wycombe team have reached this stage of the competition and will also be the first time that they have visited St.James Park. Lawrie Sanchez could be on the look out for more loan players after keeping the team locked in the dressing room for 30 minutes after the final whistle of the 2-1 home defeat to Millwall. Sanchez described his players as naive after failing to keep a clean-sheet for the ninth time in the last ten league games. Sanchez was also unhappy with referee Michael Jones after he didn't allow his earlier leniency to continue for the entire 90 minutes. With three minutes remaining Jason Cousins was shown the yellow card and will now serve a one match ban against Bournemouth on Boxing Day. Michael Simpson will also miss one game after his booking at Burnley took him to five yellow cards. Matt Lawrence, Sean Devine, Paul Emblen and Steve Brown are also just one more booking away from an automatic ban. Wycombe will return to The Manor Ground for the third time this season after the draw for the Second Round of the AutoWindscreens Shield paired The Wanderers with Oxford United. Wycombe drew 0-0 with United earlier this season while the FA Cup saga with Oxford City had its final installment at The Manor Ground. The tie will take place the week commencing 10th January 2000. A weakened Wycombe reserve side lost 4-0 at home to Portsmouth in the Avon Insurance Combination match at Adams Park on Wednesday afternoon (8th December). With the Youth Team having played the night before, Wycombe had to call in Assistant Manager Terry Gibson for a full ninety minutes and his friend Mark Fabian to make up the numbers. 'Gibbo' saw a shot clip the top of the bar before Pompey took control with two goals in each half. 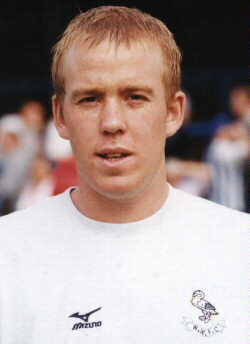 Danny Bulman was forced to play in the right-back position while Mark Westhead played the second-half after Mark Osborn picked up a minor injury. There was good news in that Lee Holsgrove played his first game for several weeks. Wycombe Team: M Osborn (sub 45 Westhead), Bulman, Fabian, Holsgrove, Leach, Lee, Senda, Harkin, Thompson, Gibson, Brady subs not used R Johnson, P Johnson, Coltman. Wycombe Wanderers Youth Team won through to the Fourth Round of the FA Youth Cup for the first time ever following a 1-0 victory over Birmingham City on Tuesday evening. Having beaten Tonbridge Angels and then Southend United after replays, it was an excellent result at St.Andrews for Wycombe's youngsters. The vital goal came after 23 minutes from Leeyon Phelan following a long throw from Ben Towsend. The draw for the next round takes place on Monday 13th December with the tie due to be played in early January. Sean Devine's penalty miss at Burnley capped a bad ten days for Wycombe in the penalty department. On the same day that Devine hit the post at Turf Moor the Youth Team were losing 2-1 to Colchester in the Youth Alliance with Ryan Gostick and Danny Senda missing from the spot. Last week Mo Harkin started the trend when he failed to convert a penalty in the Avon Insurance League Cup game with Bristol City. The recent suggestions that Wycombe would be better off playing in Milton Keynes will have left a bitter taste in the mouths of many Wycombe fans despite the Club trying to backtrack on what Club Chairman Ivor Beeks described in last weeks BFP as "flippant remarks" . The subject was raised at last week's National Federation of Football Supporters' Club meeting, ironically held at Adam Park. It as confirmed at the meeting that Football League rules state that "Each Club shall register its ground with the Executive and no Club shall remove to another ground without first obtaining the consent of the Board." The National Federation of Football Supporters' Clubs was appalled at the suggestion of a Wycombe move. Chairman Ian Todd later told Chairboys on the Net "Where permanent club moves have been suggested in the past, Federation has extracted from the Football League an assurance that any new ground would be expected to be located within the conurbation it serves and from which the club draws the vast majority of its support. We could not accept that Milton Keynes fell within these criteria and would actively oppose any such application from Wycombe Wanderers to the League." Wycombe have signed former Liverpool and Everton central defender Gary Ablett on loan from Birmingham City until the end of December. Lawrie Sanchez moved in for the 34 year old as immediate cover for Jamie Bates who is suspended for the trip to Burnley on Saturday. 6'2" Ablett has a wealth of experience with close to 400 first class appearances after starting as an apprentice at Anfield. He joined Birmingham at the start of the 1996/97 season and was a regular and skipper before a knee injury forced him to miss the last ten months. He has recently returned to action playing for City reserves but Birmingham manager Trevor Francis has allowed the player to gain first team experience with Wycombe. Ablett's contract is due to expire next month. Wycombe's reserve are unlikely to qualify for the next round of the Avon Insurance League Cup after losing 2-1 at home to Bristol City in a group stage match at Adams Park on Wednesday afternoon. Wycombe fell behind the first-half but had a host of chances to equalise after the break. In the 71st minute Mo Harkin saw a penalty saved by the City 'keeper while Danny Senda missed an open goal. Martyn Lee looked to have grabbed a draw for Wycombe when he shot home from the edge of the box but City scored in injury time after Mark Osborn was caught out of position in the Wycombe goal. Loan player Matt Brady had another uneventful game in a Wycombe shirt. Wycombe Team: Osborn, Townsend, R Johnson, Leach, Beeton, Lee, Harkin, Bulman, Senda, Thompson (sub 64 Simpemba), Brady subs not used Gostick, Williams, Coltman and P Johnson. Wycombe's 1999/2000 FA Cup campaign came to a close on Tuesday evening following an unlucky 2-1 reverse to Wigan Athletic at the JJB Stadium. Sanchez stuck with the same line-up to the side that beat fourth placed Brentford on Saturday and the Blues following were delighted when Andy Baird gave Wycombe a first-half lead. However, as with the first game at Adams Park, Wycombe couldn't hold on and Wigan eventually clinched a home tie with Wolves in the Third Round thanks to a late winner from Simon Haworth. Wycombe had a strong claim for a penalty turned down in the 50th minute when Baird was upended by Pat McGibbon. Lawrie Sanchez looks likely to dip into the loan player market later this week as cover for his rapidly diminishing squad. With long term injuries to central defenders Paul McCarthy and Mark Rogers plus a one match suspension for Jamie Bates against Burnley on Saturady, the defensive option is the expected route. Last week it was reported that Wycombe were interested in signing Bristol City's unsettled striker Steve Torpey but City suggested that they were only willing to let the 6'3" player go on a permanent deal. Paul Emblen is likely to miss the next two months, after breaking his ankle in Saturday's 2-0 victory over Brentford. The midfielder had only been on the field two minutes as a substitute for Andy Baird, when he came out awkwardly from his first challenge. Emblen has played over 60 times for Wycombe since joining from Charlton Athletic last season and is remembered with affection by Wycombe fans as the player who kept the side up with his late goal at Lincoln last May.